Is your baby getting pimple-like bumps on its beautiful little chin? Is it even possible for babies to get acne? It turns out acne and pimples are not exclusively for teenagers; babies get them too. And no, it doesn’t mean your little one skipped the infant stage and went straight to puberty. Fortunately, there’s no immediate need to seek medical advice, it’s completely normal. Today we’ll answer all of your baby acne questions. So get your notebook ready and let’s dive in! Why Does My Baby Have Acne? How Long Will My Baby’s Acne Last? An Indicator of Future Skin Problems? Baby acne is a term used to describe an acne-like breakout on your newborn. It is usually a temporary skin condition, which causes red or whitish bumps on the face and body. There are two types of acne occurring in babies — neonatal acne and infantile acne. If your baby has acne before six weeks of age, doctors refer to it as neonatal acne. About 20 percent of newborns develop this type, and it mostly affects boys. Some may even have it from the moment they enter the world. Doctors, nonetheless, don’t consider this true acne, but more on that below. Neonatal acne generally appears on the face — on the forehead, cheeks, and chin. Sometimes it runs down the back or chest. The affected areas may look bumpy and oily, much like they would on an adult. Still, the breakouts can also simply appear as small red dots. 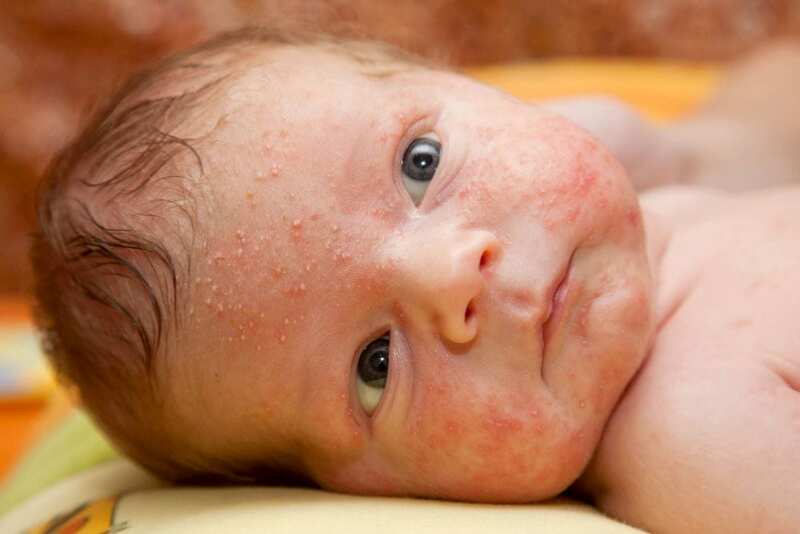 If your baby is between three and 16 months, doctors call it infantile acne. This type is less common, affecting approximately 2 percent of babies. But, much like neonatal acne, boys are more likely to develop it. Infantile acne is a bit different from the baby acne most of us know. 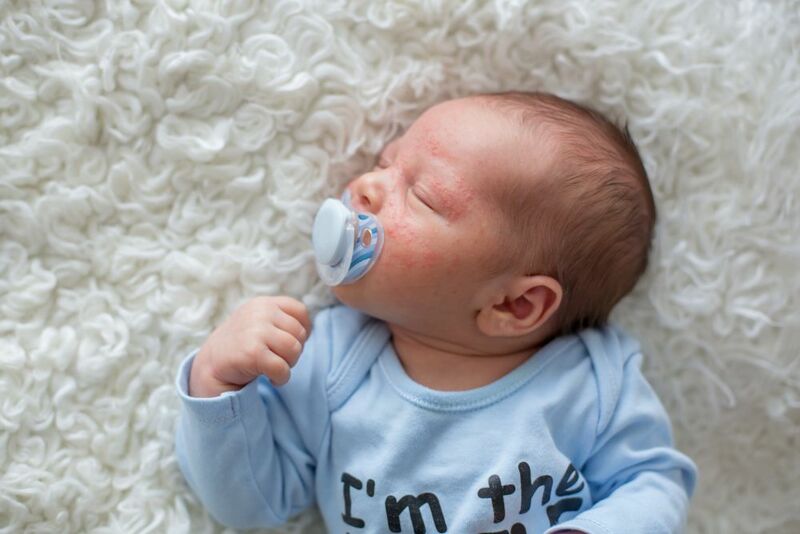 Your baby may still have red and whitish bulges, but blackheads and nodules can also appear. These typically surface in clusters, and the bumps may contain pus. Infantile acne usually runs its course. However, in rare cases, it can be persistent and difficult to get rid of. And unlike neonatal, this type is generally viewed as true acne. This is not easy to answer. Acne, for adults and babies alike, remains somewhat of a mystery to this day. Some experts have chalked it up to hormones, but others suggest it’s caused by sensitivity to a yeast which naturally lives on baby’s skin. Hormones and their side effects are most likely the cause of some of the worst experiences throughout pregnancy. During the three trimesters, they trigger anger and tears for no reason. And, to be frank, turn us into emotional wrecks at times (source). But especially toward the end of pregnancy, these hormones overflow and span the placenta, thus entering into the baby’s system. From here, the hormones will overstimulate the oil glands in the unborn baby’s skin. In turn, this can cause a breakout of neonatal acne (source). The cause of infantile acne is, however, not Mommy’s fault (hurrah!). When acne develops after three months of age, it is sometimes due to an imbalance in your baby’s system. This imbalance triggers an overgrowth of skin glands, thus causing acne. Yeast, or more specifically, the Malassezia species, is a well-known fungus found on the outer layers of our skin. It usually only causes harm when it’s allowed to enter the deeper layers. However, because the newborn’s immune system is still developing, yeast can cause an inflammatory response. This, in turn, may cause an acne flare-up. Some suggest that an overreaction to yeast is the sole cause of neonatal acne. This is also why some experts don’t consider this type to be true acne (source). Some types of medication can potentially cause an acne-like rash on your baby. It’s relatively easy to spot this —maybe your baby was sick and prescribed a specific medicine. Or perhaps you became ill, and your baby was exposed to the medication through breast milk (source). In these cases, seek medical advice to prevent any further reactions. Skincare products are necessary to combat dry skin. However, they can also trigger acne, especially if they are too oily. A baby’s skin is extremely sensitive and products must be mild and safe for babies. Too much oil will block the pores and thereby cause an outbreak of acne. The duration will depend on the type your baby has. 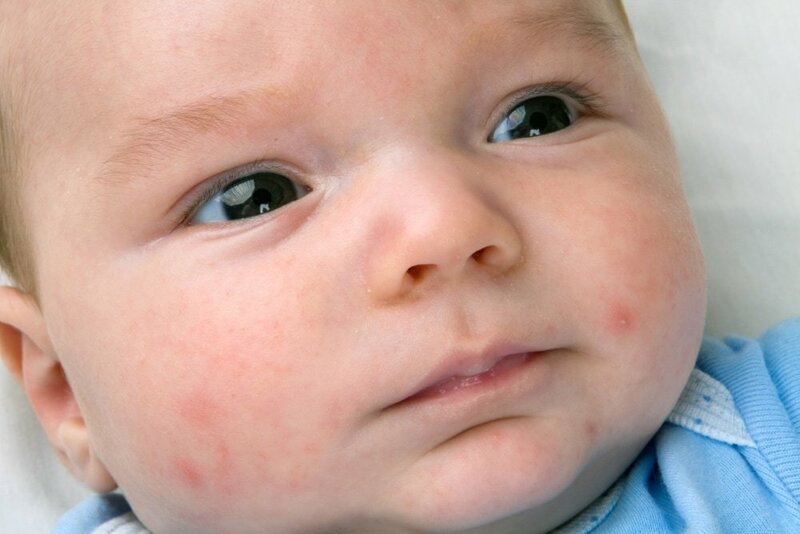 Neonatal acne generally runs its course before four months of age. This type usually doesn’t leave any scarring or marks later on. Infantile acne, however, can be more persistent. Sometimes it can last up to two years, if not more. This may require treatment, especially if it seems tenacious — it can also leave scarring if not treated properly (source). It’s almost impossible to tell what issues we must deal with in the future. But there are some clues when we are babies. If your baby has neonatal acne, there’s no need to worry. Although your child may still develop acne as they grow up, it isn’t due to your pregnancy hormones. There is no connection between baby acne and the acne that teens and adults suffer from. Infantile acne, on the other hand, can sometimes indicate that acne is also in the cards in the future. Some studies revealed this type could lead to more severe cases of breakouts during adolescent years (source). There are several conditions which can cause acne-like breakouts. Fortunately, most of these usually don’t require a visit to the pediatric office. Eczema is a skin condition affecting babies and children. It causes dry, flaky skin, appearing as rashes, generally on the face and torso, but may spread to other parts of the body (source). You can often tell acne and eczema apart by the texture of the breakout. Acne will cause oily, shiny skin, whereas eczema causes dryness and potential peeling. Erythema toxicum is a relatively common skin condition, affecting about half of newborns. It causes rashes, consisting of yellow or whitish bumps, surrounded by redness, appearing on the face (source). In contrast to its complicated name, this condition is not a cause for concern and will disappear on its own. Milia are tiny white bumps appearing around the nose, eyes, and cheeks. The bulges are dead skin cells, trapped underneath the outer layer. This condition is normal and will usually go away after a couple of days (source). Heat rashes occur when your baby is too hot. These rashes can cause acne-like breakouts. However, they tend to show up in sweatier places such as the armpits and neck. Still, they can also appear near the hairline if your little one has a full head of hair. But unlike acne, a heat rash will subside once the temperature falls. Simply put, cradle cap is dandruff for babies. This common occurrence causes an oily rash, generally at the crown of the head. The area will look scaly, sometimes red or yellow in color (source). Much like baby acne, the exact causes of cradle cap remain a mystery. Experts believe it’s also due to an overdose of mother-to-fetus hormones, which causes overproduction of oil glands. Even though baby acne can look similar to adult acne, you must treat it differently. Keep in mind that infant skin is sensitive, and handling it incorrectly could result in scarring. Additionally, never try to pop any pimples or squeeze any blackheads. Yes, I know it may be tempting. But, not only can you increase the chance of infection, you’re also likely to hurt your baby. So, to all of you pimple-popping mommas, here are a few ways to treat your baby’s acne. Any residue present on your baby’s face can cause irritation and make the acne worse. Whether it’s vomit, or simply spit up milk, make sure you wipe it off. With some lukewarm water and a cotton pad, proceed to wash your baby’s face gently. You can apply some hypoallergenic soap or a soap-free cleanser. As long as it’s fragrance-free, it won’t irritate the skin. Avoid using a coarse washcloth on your baby’s face. Following bath time, it’s essential you gently pat your baby dry with a towel. Make sure you dry in between all the folds and creases. Towels can be notoriously harsh on sensitive skin. In fact, they can work as exfoliators. So you can imagine the irritation they might cause on your baby’s acne if you begin to rub them dry. No matter how soft the towel, dab gently rather than roughly rubbing. After a wash, apply a moisturizing lotion. Baby’s skin has to be ready to combat the rough environment we live in. By using a hypoallergenic moisturizer, you are ensuring your little one’s skin remains healthy and supple. However, avoid any lotions and creams that are too oily. As I mentioned earlier, this can clog up the pores and make the acne worse. Dry air can cause acne flare-ups. By using a humidifier, you can add some moisture to the indoor atmosphere. This may be particularly helpful during the cold winter time, when dry skin is more likely. Breast milk holds many powers. It contains lauric acid, and thus it can act as an antibacterial and anti-inflammatory agent (source). Take a few drops of breast milk, then wipe it over the acne and leave it to air dry. Some mothers swear by this old wives’ tale remedy. Coconut oil is the savior of acne-prone skin. It contains an array of nutrients, some of which include vitamin E and K, and lauric acid, among many others (source). Skin readily absorbs it, and it’s quick to restore lost moisture and make the surface appear supple. But of course, as with any natural product, consult your pediatrician before the first use. If you are nursing, there might be something in your diet which is causing the acne on your baby’s face. Some products, such as dairy and citrus, can contribute to skin issues. Consult your pediatrician about which diet changes are necessary. The best way to treat baby acne is to prevent it from developing. Sometimes the harsh chemicals and additives found in our detergents can remain in clothes and bedding. If your baby already has sensitive skin, it could cause, or worsen, the acne. Avoid using these products and, instead, opt for a chemical-free detergent. These are natural and much milder for your baby’s skin. If your baby has a case of neonatal acne happening before six weeks, there shouldn’t be a need to worry. You can follow some of the treatments above and it will no doubt run its course. But of course, always consult your pediatrician if you’re in doubt. Specialists recommend you seek medical advice if your baby develops acne after six weeks of age. This is generally to implement the right treatment to prevent scarring. Doctors will usually treat it with topical creams and oral medicines (source). However, sometimes, infantile acne could be an indicator of a health issue in your baby. Your doctor might carry out blood tests or an X-ray to eliminate other conditions. Baby acne is a common occurrence and usually nothing to worry about. Even if it develops after six weeks of age, it generally disappears with the right treatment. As a mom, make sure you keep your baby’s face clean and moisturized. Avoid harsh fabrics, and products containing soap and perfume. Did your baby have acne? Have you ever tried using breast milk as a home remedy? Do you have other suggestions that might help other moms? Please let us know below, and share this article with any other moms you think would benefit from it.